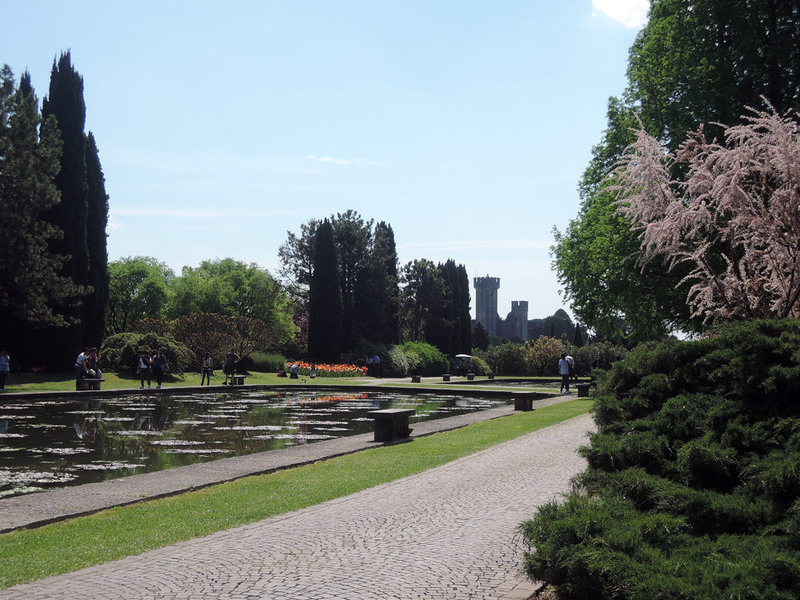 Spending a weekend in Borghetto sul Mincio in April we couldn’t miss the famous Sigurta Park and its famous tulips in bloom. The Sigurta park history dates back to 1407 when it was just an enclosed cultivated land with a main house and a small garden. Over the centuries the property passed into the hands of many illustrious families. When Giuseppe Carlo Sigurtà bought it in 1941, the park was in state of neglect. Luckily he accidentally found out that the estate had the right to collect water from the river Mincio. Thanks to this, the park could flourish again. It was open to the public in 1978. In 1859 during the Second Italian War of Independence, Franz Josef of Austria and Napoleon III of France witnessed from the “Poggio degli Imperatori” (Emperors knoll) the San Martino and Solferino battle. The park is 600,000 square meters big. Each year the park admissions are about 300,000. Among the others, there’s a special oak tree, called Grande Quercia (great oak): 400 years old, 6 metres of trunk circumference and 120 metres circumference of the canopy. The Labyrinth occupies a 2500 meters area and about 1500 yew trees compose it. The Castelletto (little castle) hosts historical memories of scientist and Noble prize winners, who used to visit the park: Domagk (discoverer of sulphonamide), Fleming (penicillin discoverer), Waksman (Streptomicina discoverer), Konrad Lorenz (founder of Ethology) and Sabin (developer of the polio vaccine). 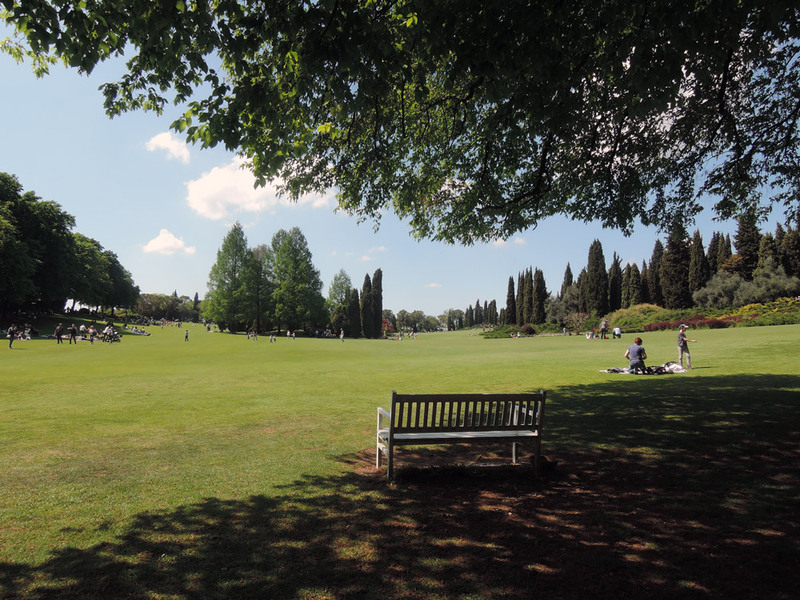 Some of the awards won by the park: First prize Great Italian Gardens (2011), Most Beautiful Park in Italy (2013), Second Most Beautiful Park in Europe (2015). The motto of the Sigurtà family is “Laboravi fidenter” (I worked with passion). We arrived at 10.30 am after parking (10 minutes walking distance along a street nearby) and there was a huge queue to enter. I thought “Oh my God, this will require 1 hour” but luckily the “flowing” was quick so we waited “only” about 15-20 minutes. After paying for the entrance ticket we had to go to the renting spot to rent the cart, which is very expensive (16€ per hour. After the first hour you pay 4€ every 15 minutes. But you can’t visit all the park in less than 2 hour ad a half!). You can visit the park on foot or renting there a bike (but you can also use your own bike), a golf cart, a shuttle or on board of the park train. I wasn’t in great shape that day so I preferred to rent the cart and be sure to visit all without problems. The park is big and several paths are uphill and it is not that easy to cover it all. Even by bike can be tricky. In fact I saw many people carrying thae bike by hand. Tulips. I went on April 16th and they were in full bloom. The funniest thing was seeing all the people trying to take pictures of the tulips. So you could spot people of all ages standing, lying down, bending in all positions to take the best shots. Including me, obviously. Driving the electric cart. As usual at first I was scared, but after 1 minute I wanted to leave the park and go home with my cart! So funny! I was a bit dizzy that day (low vitamin b12) and the cart saved my day, cause the park is huge and I really wouldn’t have made it just walking. The Great Lawn is just charming. I don’t know, maybe abroad there are many parks with lawns similar to this but in Italy we’re not used to such bright green perfectly mowed lawn. Plus seeing people walking, playing and having fun was heartwarming. Roses Avenue: It was beautiful. Must be a marvel in May with roses in bloom and the view of the Castle at the end of the road! Labyrinth: quite funny and you can choose. At the entrance there is a way which leads you directly to the centre. Or you can take the long way and get lost. I got lost to reach the centre. But I got out going through the straight way. The Youth stone message (see below). The acers. Aren’t the acers one of the most beautiful trees ever? So I’m biased, I love acers. End of discussion. You see, I’m open to dialogue. The view from the Emperors knoll was really nice. The educational farm. I was happy cause I petted a donkey. But the animals are too few! If I’m not wrong there were 2 donkeys, 2 sheeps, some turkeys, chickens, ducks and goats. No pigs 🙁 and no geese 🙁 Still, little kids seemed to enjoy the place very much. The Castelletto is nice but you can only admire it from the outside. The Hermitage was more beautiful seen in the background of the Great Lawn, especially since it was closed. 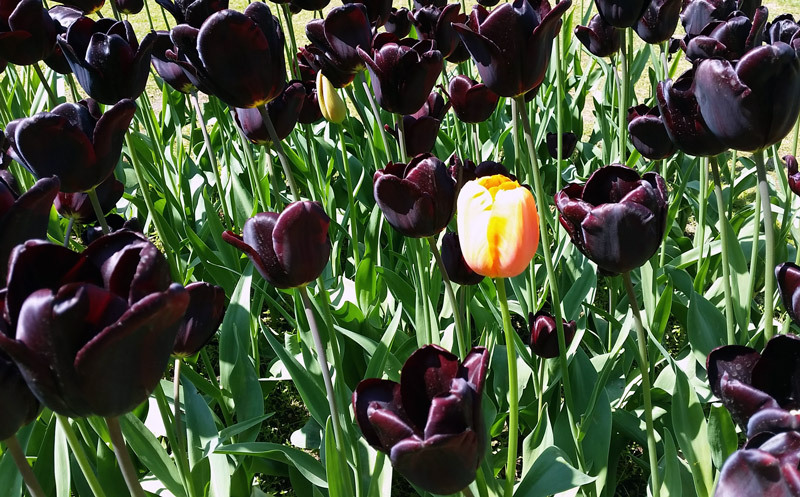 But it was surrounded by tulips so… I enjoyed it all the same. The turtle pool: there was just one turtle and she (tartaruga in Italian is feminine) was very standoffish. Youth is not a period in your life. It is a state of mind. You will remain young as long as your heart will be able to receive messages of beauty, boldness, courage, greatness and strength that will come to you from the earth, from a man or from infinity. Pets are not allowed in the park, with the exception of guide dogs. Keep in mind: the sooner you arrive the better. When we went out in the afternoon there was a considerable queue not to enter but to rent a bike or cart. The panino we ate at lunch at the Animal Farm wasn’t the best of my life. Potatoes were very good instead. The entrance fee can seem a bit pricey but you have to admit: the park is immaculate. Another positive aspect was the staff: all the members whit whom I dealt were super kind (especially the guys at the cart rental). Early Spring: hyacinths, daffodils and the first tulips. May: irises and roses. Along the “Viale delle Rose” (Roses Avenue) you can see 1 kilometre of rose bushes (30.000 specimens). Summer: water lilies, lotus, water hyacinths, dahlias. Autumn: asters, sunpatiens, coleus, marigolds, begonias and zinnias.